Will Anderson Township welcome syringe exchange? ANDERSON TOWNSHIP, Ohio -- A syringe exchange program could be coming to this East Side neighborhood as leaders work to curb alarming spikes of HIV and hepatitis C they say have been driven by the opioid epidemic. Hamilton County saw a 34 percent spike in new HIV cases last year, with 184 newly diagnosed cases. Northern Kentucky logged 37 new cases in 2017. Public health officials say the programs, which give IV drug users clean needles and offer a range of testing and medical services, are critical and proven to reduce the spread of life-threatening and costly infectious diseases. But in some parts of the region, similar programs have received considerable pushback. Opponents argue the services enable illegal behavior because they provide tools to use drugs. Anderson Township’s Board of Trustees is hosting three public meetings on the topic starting Wednesday afternoon. Two township-owned properties are being considered as locations to host the program: 6835 Kellogg Ave. near Five Mile Road and 8330 Broadwell Road. If approved, a van staffed with medical professionals would visit the chosen location once a week. Workers from Hamilton Public health and Mercy Health would oversee the needle exchange and conduct testing for HIV and hepatitis C. Clients would also be able to speak with a treatment and recovery specialist. “Statistics show one year of this program costs less than treating one case of HIV or four cases of hepatitis C,” said Vicky Earhart, Anderson Township administrator. “Significant studies have shown that these programs do not increase drug use, but in fact actually help to reduce blood-borne infections and diminish other health risks." Local health officials will be at each of the public meetings to offer more details on the program and be available to answer residents’ questions. Wednesday, Jan. 24 – 3 p.m. at Anderson Senior Center, 7970 Beechmont Ave. The Cincinnati Needle Exchange van parked in Northside in March 2017. 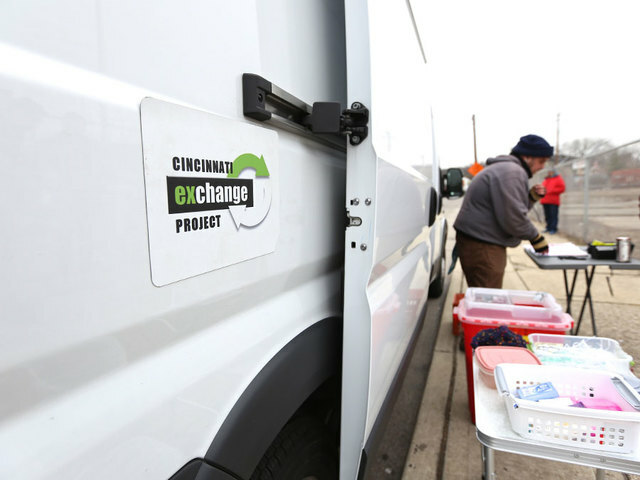 The Anderson Township exchange site would be part of the broader Exchange Project recently launched by Hamilton County Public Health, Cincinnati’s Health Department, University of Cincinnati’s Medical College and Interact for Health. Local health officials spent much of 2017 collaborating on how to shift the Cincinnati Exchange into the mix of public health programs offered by Hamilton County and Cincinnati's health departments. Doing so, leaders say, has helped ensure a steady stream of funding, with up to $400,000 committed this year across the four groups supporting the program. By the end of the year, officials hope to open additional exchange sites in western and northern Hamilton County, Clermont County and Cincinnati. “Everyone knows someone who has been touched by this epidemic, and this is a program that is there to help our friends and loved ones suffering from the disease of addiction,” Ingram said.